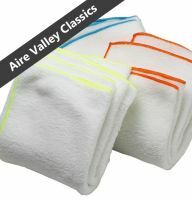 Did you know that a some microfibre cloths can actually scratch chrome and soft metals? But with our super high density ultra soft microfibre cloth that will not happen! This specially created cloth has a short but very dense pile on one side, which is ideal for the application of Quick-Glo P3-Ultra. The other side has a longer pile which is used for buffing up - this works particularly well with P3-Ultra on plastics. Especially recommended for the application and buffing of the Quick-Glo P3 Ultra formula, but works just as well with Original and Fine. We are the UK's only suppler of this item!